The Round Lake Area Exchange Club and sponsor, Savory Spice Shop Libertyville are proud to announce the September hometown hero, U.S. Air Force Major Angela Jimdar. Jimdar was raised in the Village of Round Lake Beach and is a graduate from Round Lake Senior High school. She is an Analyst working in the headquarters Air Force Recruiting Service and currently resides in Arkansas with her husband, Mark, an active Airman and daughter, Kera. She was registered for this honor by life long friend, Melisa Cuellar of McHenry. Jimdar will be retiring from service this year, as she served our country for 20 years. 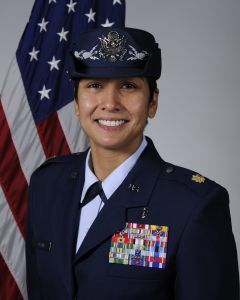 During her military tenure, she earned her Masters Degree and has received many medals and awards some of which include: Defense Meritorious Service Medal-Afghanistan, Meritorious Service Medals, four Commendation Medals, three Achievement Medals, Military Outstanding Volunteer Service Medal, Airman of the Year and Health Facilities Officer of the year. All heroes receive a “Hanging with the Heroes” care package delivered with a personalized “Hanging with the Heroes” t-shirt (donated by Artrageous of Hainesville), a piece of home and letters from Round Lake Area School District 116 students. Heroes also will receive a specially made rosary for the military from Legion of Mary from St. Joseph’s in Round Lake. Jimdar’s package will also be filled with spirit wear from her alma mater Round Lake School District 116, as “She is very sentimental to her hometown,” according to Cuellar. With the help of this months sponsor, Savory Spice Shop Libertyville, she will receive a memory-filled package. The Round Lake Area Exchange Club will present a plaque to her family on Wednesday, September 25 at 7:30 a.m. at their meeting located at Panera Bread meeting room in Round Lake Beach. Any and all military personnel serving overseas or in the USA from any of the Round Lake Areas, Hainesville, Fox Lake, Ingleside or surrounding areas qualify for the program. If you have a neighbor, family member, friend, employee, employer, etc. serving in the military please register them by going to www.rlaexchange.org/hero, five minutes is all it takes. We look forward to announcing the October Hometown Hero. For more information visit the web site or you can contact Sherry Ridge at 847-740-2379.